Whenever we are solving a thermal problem where radiation is significant, we need to know the emissivities of all of our surfaces. Emissivity is a measure of the ability of a surface to emit energy by radiation, and it can depend strongly upon the wavelength of the radiation. This is very relevant for thermal problems where the temperature variation is large or when there is exposure to a high-temperature source of radiation such as the sun. In this post on thermal modeling, we will look at how to include wavelength-dependent surface emissivities in a problem that is of importance to everybody: Having a relaxing day at the beach! The problem we will look at is of two styrofoam coolers containing beverage cans that are initially at 1°C. 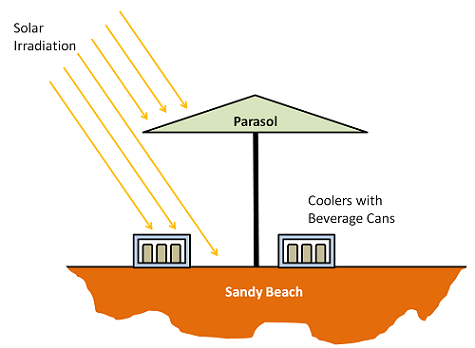 The coolers are on a sandy beach, and a parasol overhead will provide partial shade during the course of the day. We want to find out how long it takes for the beverage cans to warm up. But before we do that, let’s look at some of the fundamentals. where \epsilon is the wavelength-dependent emissivity, and \sigma is the Stephan-Boltzmann constant. If the emissivity is unity, then we would say that the surface is an ideal black body, but all real surfaces have an emissivity that is less than unity. The above equation is reciprocal, that is, it holds equivalently if the surface is hotter or colder than ambient. Another way of saying this is that the emissivity equals absorptivity, where absorptivity is the measure of how much of the incident radiation is absorbed by a surface. From here on we will use these terms interchangeably. So if we know the incident radiative flux on a surface and the surface absorptivity, then we know how much heat is being absorbed. 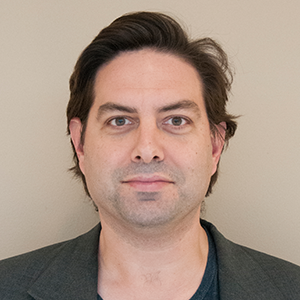 We will assume that we are dealing with opaque materials, so all incident radiation is either absorbed or reflected, and there is no transmission of radiation through the cooler walls. Keep in mind that emissivity is not just a material property, but can also be a function of the surface treatment. A matte surface and a very smooth surface made of the same material can have different emissivities. We will also assume diffuse reflections, and neglect any directional dependence of absorptivity, a valid assumption unless we are dealing with highly polished surfaces like mirrors. Now the interesting part of this analysis will be that the surface absorptivity (emissivity) of our coolers varies quite significantly with wavelength. This wavelength dependence is important because we have radiative heat transfer in different spectral bands. An object can be considered a black body if it emits electromagnetic radiation following Planck’s Law. A good example is the sun; the solar spectral distribution follows very closely to that of a black body at 5,800 K if we are outside of the atmosphere. The earth’s atmosphere absorbs some of this energy, but at ground level the shape of the spectrum is still quite close to that of a black body. For a lot of problems of engineering interest, the peak temperatures will not get above 500 K, so let’s look at the fraction of energy emitted at each wavelength for a black body at 5,800 K and 500 K.
We can see that most of the radiated energy from a 5,800 K object is in the spectral band of wavelengths shorter than 2.5 microns, whereas most of the energy from the 500 K object is radiated at wavelengths longer than 2.5 microns. 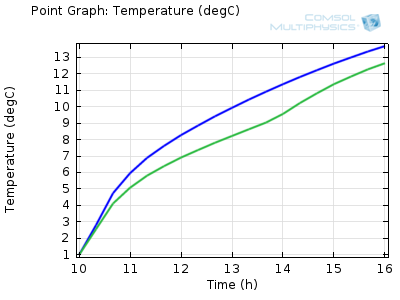 When we overlay the emissivity of our coolers onto this graph, we see that the wavelength-dependence of emissivity is quite important. The engineers who designed these coolers chose a material with a low absorptivity in the solar spectral band, meaning that only a small fraction of the incident solar radiation is absorbed. On the other hand, in the long-wavelength spectral band the emissivity is higher, meaning that, since the coolers will be much less than 500 K, it is easy for heat to radiate away. When you are using the Heat Transfer Module, you have the option to specify wavelength-dependent emissivities. It is often sufficient to use only two spectral bands, as shown above, but you can have up to five. 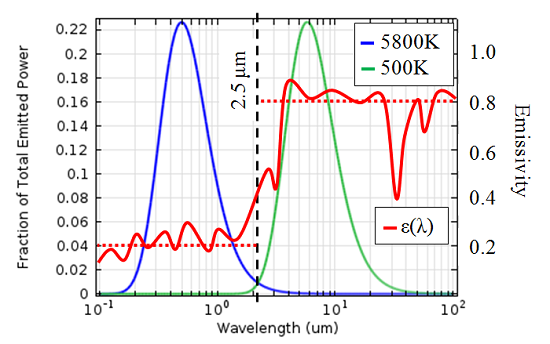 Although emissivities can vary strongly with wavelength, it is often sufficient to use an average value over the band, or to choose the value corresponding to the expected peak in the black body spectral distribution. Settings for handling multiple spectral bands. 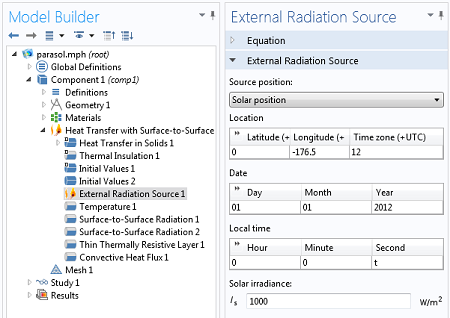 We will include an External Radiation Source feature to model the solar irradiation. This allows us to enter a latitude, longitude, and time of day, as well as a solar irradiance. COMSOL will compute the incident solar heat flux, and consider the shadowing due to the parasol. Settings for the External Radiation Source. Solar irradiation at three different times of day. unshaded (blue) cooler over time. We can see from the results that the beverage cans in the shaded cooler will stay below 10°C for about an hour and a half longer than those placed in the direct sunlight. This means that you have more time to relax with a cold drink on the beach! Whenever you are dealing with a thermal problem where your system is exposed to sunlight, or if you have large temperature variations in your system, you can have radiation in multiple spectral bands and will need to consider wavelength-dependent emissivity. This functionality is available in the Heat Transfer Module. If you would like to learn how to set up this kind of model yourself, check out our Parasol model. If you are interested in using COMSOL Multiphysics for your thermal modeling needs, please contact us. 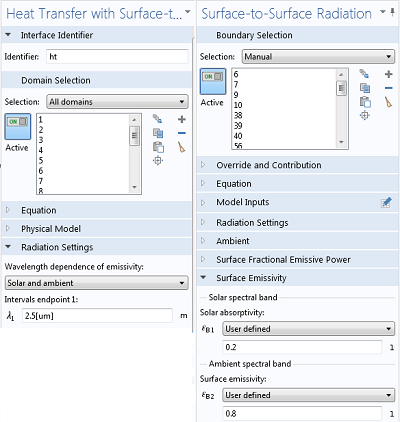 I understand we can specify different emissivities for one to five wavelength intervals in COMSOL. However, I would also like to specify a particular irradiance for short wavelengths and another one for long wavelengths. Does anyone knows how to do it? You would use the “External Radiation Source” feature for this, similar to what is shown in the above screenshot, but specify a “User defined” source power definition. Air solar collectors are a kind of heat exchangers that transform solar energy into heat. Typical air solar collectors consist of a case, which holds a back insulation, an absorber and a transparent cover (glass). The transparent cover reduces heat losses towards the front, meanwhile the air flows in between the absorber plate and the thermal insulation. I have seen all your blogs and I can not get any related tutorial or blog. the issue is, I am stuck since months in how to simulate or model the glass cover correctly in terms of the effect of absorption, emission and reflection. The thickness of glass cover is between 3-5 mm. Please, it will be very helpful if you offer any help.